(Nanowerk News) A Swedish company has cracked the challenge of scaling up wave energy, with the help of technology from researchers at KTH Royal Institute of Technology. Artists' rendering of the CorPower wave energy converter. CorPower Ocean's new wave energy system, which uses a gearbox design that KTH researchers helped develop, generates five times more energy per ton of device, at one third of the cost when compared to competing state-of-the art technologies. Energy output is three to four times higher than traditional wave power systems. The company's innovation was recently awarded EUR 100,000 at the MIT Building Global Innovators Demo Day. Wave energy has been held back in part because of the cost of electricity generation. The amount of steel and concrete needed in order to produce each MWh has simply been too great to make it into a profitable business. Even still, the power of waves presents a problem with reliability; and because waves vary greatly in height and timing, it's difficult to create a conversion system that functions across the full wave spectrum. 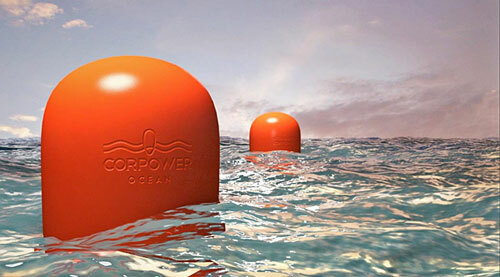 Known in the wave energy industry as a point absorber type system, the CorPower converter consists of a buoy that absorbs energy from the waves, plus a drivetrain that converts the buoy's motion into electricity. The company's system is based on Swedish cardiologist Stig Lundbäck' patents, some of which are inspired by his research into heart pumping and control functions. CEO Patrik Möller says the CorPower wave energy converter can manage the entire spectrum of waves, unlike competing systems. Methods for phase control, in which compact wave buoys swing in resonance with ocean waves, have been studied by researchers in Trondheim since 1970s, and the CorPower project works closely with researchers from NTNU. The system tested well in Portugal and France and a driveline scale of 1: 3 has recently been installed in a large test setup at the Department of Machine Design at KTH. "Unlike other wave power systems, ours actively controls the timing between the buoy and the incoming wave, with the help of a unique drivetrain," Möller says. "We can ensure that it always works in time with the waves, which greatly enhances the buoy's movement and uses it all the way between the wave crest and wave trough and back in an optimal way, no matter how long or high the waves are." A close-up of the CorPower wave converter's "cascade gear" system. The system also boasts a specially-designed rack and pinion gear solution developed in cooperation with the Department of Machine Design at KTH and gear expert Stefan Björklund, among other partners. The so-called cascade gear provides a robust and efficient way to convert linear motion into rotation, Möller says. 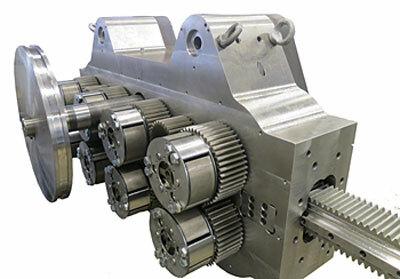 The novelty of the invention is its capability to handle heavy loads and high velocities efficiently, with numerous small pinion wheel parts sharing the load. "The cooperation with KTH around gear technology has been crucial to the rapid developments over the last two years, and we hope to deepen cooperation with KTH with more research on gear technology and lubrication," Möller says. The buoys are compact and lightweight and can be manufactured at a relatively low cost. A buoy with 8 meters in diameter can produce 250-300 kilowatts in a typical Atlantic Environment. A wave energy park with 100 buoys can generate 25 to 30 megawatts. A pilot installation of the technology (scale 1:2) will be exhibited in the Atlantic in November 2015 in cooperation with the multinational electric utility company Iberdrola. CorPower Ocean is a Swedish company that developed through the support of the European research effort KIC InnoEnergy, an innovation-promoting collaboration between academia and industry in the context of renewable energy, in which KTH is important partner. Swedish Energy Agency is a co-financier.